Neurosis needs no introduction. The Bay Area's legendary masters of behemoth, psychedelic operatic guitar girth has influenced a wide array of artists and nearly singlehandedly defined vast extremes of heavy music popular today. 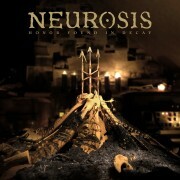 However, now in its third decade, Neurosis' latest album finds the group's sound transforming yet again so dramatically that even to diehard fans, Given To The Rising might seem starkly different, a stunning reintroduction. Given To The Rising is like being submerged in an isolation tank -- it's enveloping, subverting the senses with surreal visions we'd swear were our own, cleverly jarring and disorienting consciousness beyond any footing in reality. As any diehard Neurosis fan will tell you, there's a moment with every new record and live show at which the band will stop as if the world has frozen in position, then suddenly kick into the primordial wail that we've all come to recognize as the "Neurosis note" that forces the listener's head and shoulders to lurch and sway almost uncontrollably. Given To The Rising is Neurosis at its most captivating and hypnotic. Put simply, the album is some of the band's most raw and immediate material to date, but it is also more complexly orchestrated and richly thickened with psych-damaged overtones. Given To The Rising is more than a just a powerful collection of songs -- it's more like a religious experience. While personal epiphanies are repeatedly told by those who've been converted by Neurosis' sensory overloading live show as well as its recordings, there's a hypnotic quality to this album that takes hold from the opening guitar squall of the title track. Once again recording with revered engineer and longtime friend Steve Albini (as the band has for five previous albums,The Eye of Every Storm in 2004, A Sun That Never Sets in 2001, Sovereign in 2000 and Times of Grace in 1999), Given To The Rising bears the band's signature crushing heft and cathartic force. However, it also finds Neurosis delving into increasingly psychedelic effects and twisted, inventive song structures. Much of the dramatic lull of recent works is forgone in favor of full-on attack. While it's reflective of the band's signature aggressive pummeling, Given To The Rising is not just an exercise in Wagnerian thunder. Neurosis instead takes an exploration into psychoactive prog-rock and eviscerating symphonic thud that moves well beyond anything that might fit snugly within a particular genre. It's as though the band has taken cues from such psych-noise predecessors as Hawkwind, Faust, Skullflower and Chrome, merged those elements with the sickening frequency assault of Throbbing Gristle and then submerged them within Neurosis' saturated sonic strata. "We stand encircled by wing and fire" growls vocalist/guitarist Scott Kelly, opening the album and its title track, the band's heels already dug deep in the dirt, blasting forth in all directions at once. It's as though we join the battle already in progress, and by all means we have -- Neurosis has fought hard to maintain its sovereignty not just in the music business, but as a boundlessly creative entity consisting of Kelly, guitarist/vocalist Steve Von Till, bassist/vocalist Dave Edwardson, drummer Jason Roeder, keyboardist Noah Landis, and visual manipulator Josh Graham. The band brought Neurosis, Given To The Rising keyboards to heavy punk. It brought experimental noise to metal. It merged antique droning folk with Black Flag's desperation. All the while, forging onward toward new means to explore the infinite realms of catharsis and self-transformation, while myriad bands simply follow in its wake. The guitars grunt and groan like sinister beasts on "Fear and Sickness", propelled by Roeder's clever rhythmic shifts delivered by thunderous, rollicking tom beats that lunge into half-time thumping kick drum and snare blasts. "To The Wind" opens with a deceptively delicate, albeit forlorn melody unlike anything we've come to expect of the band, which is abruptly choked off at the 2-minute mark by one of the most brutally sudden shifts of mood and tempo. A slight, barely audible growl hints at the change to come, but when a wall of chiming bent- notes and drop-tuned sludge guitars, paired with a stomping beat erupt over the melody, it's truly monolithic in impact. Edwardson slings heavy low-end distortion over the top with howling bent notes adding powerful harmonic overtones. But, perhaps the highlight of the song comes during a brief respite, when Kelly lets out an astounding 29-second-long throat- curdling scream at the song's climax. Von Till's rasping whisper sounds downright haunting over the rhythmic churn and Landis' syrupy tones on "Hidden Faces" prove ample evidence to the band's latest evolutionary step. "Through eyes of the wheel I will see you coming," Von Till howls, the band erupting in consensus.